Being dead and generally uncoordinated, zombies often come by some of the strangest wounds imaginable. Of course, you can't really give yourself similar wounds - or can you? 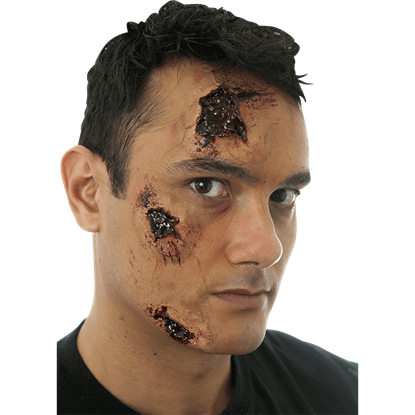 Zombies Playground is happy to offer you a number of eerie and realistic prosthetics, scars and wounds, all of which are perfect for adding any number of injuries to your zombie look! 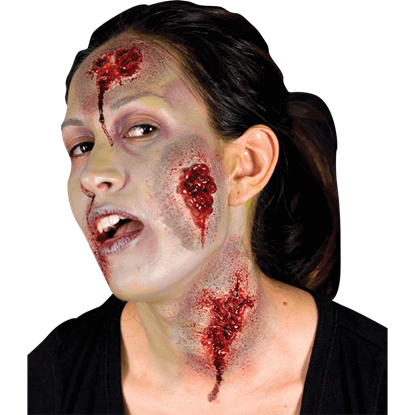 Of course, creating every wound that a zombie could possibly suffer from is virtually impossible, given that it is basically a limitless number, so instead we've compiled some of the most visually stunning and gruesome ones here for you to browse, acquire, and apply. And trust us when we say that while some of these wounds are fairly typical, like scratches, rashes, and cuts, others are truly ghastly spectacles that are sure to be noticed and admired. Scars and wounds aren't all you'll find here, though, as we also offer a number of prosthetics that fall into this category that are perfect for adding a few finishing touches to any zombie look, including noses, ears, horns, and other fake blemishes and pustules that might spring up on a zombie's skin, thanks in no small part to the zombie's infected, decaying, dead flesh. 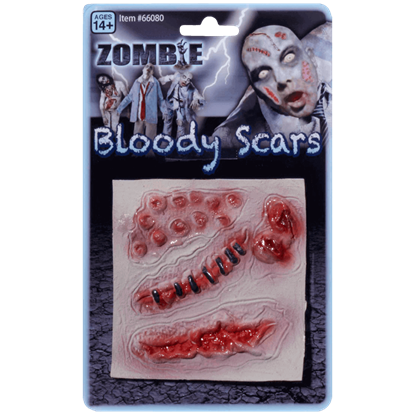 Don't drive yourself crazy trying to create and craft wound after complex wound whenever you can just as easily browse the Zombies Playground and its Prosthetics, Scars and Wounds section for an applique that looks just as good as something home-made, with far less hassle. No zombie is entirely without scars or wounds because that is likely how the virus was transmitted. 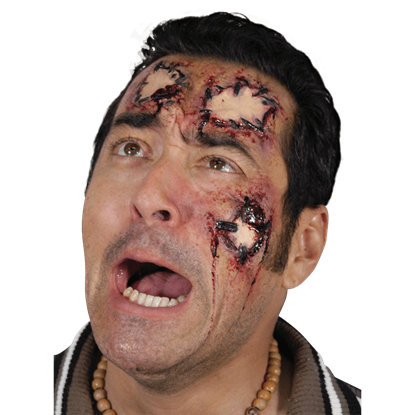 The 2 Bloody Zombie Scar kit contains two awful wounds that can make you look like a more realistic zombie. With the 3 Piece Gash Latex Appliance Set, you will look the worse for wear after a violent altercation. The gory wound prosthetic includes three realistic injuries that can be used for movie-grade special effects at home. With the 3 Piece Oozing Wounds Latex Appliance Set, you will look like one of the risen undead. The gory wound prosthetic includes three realistic injuries that can be used for movie-grade special effects at home. Enhance witch nose and chin prosthetics or other character designs with this set of three lightweight, flesh-colored latex warts. The 3 Piece Stage Warts Latex Appliance will help transform you into a witch or hag with ease. You have definitely felt the heat whenever you add this gory wound prosthetic to your next costume ensemble! 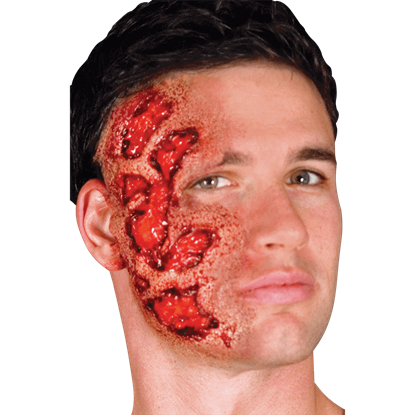 This 3D Burn Latex Appliance combines realistic texturing with hand-painting for the gruesome look of a burn scar. No zombie is entirely without scars or wounds because that is likely how the virus was transmitted. 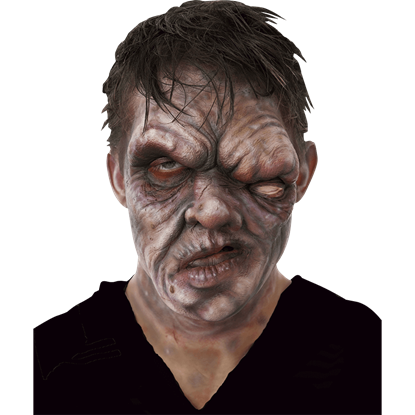 The 4 Bloody Zombie Scars kit contains several scars that can make you look like a more realistic zombie. A stitch here, a staple there, and you will be right as rain in no-time flat. Or, maybe not. 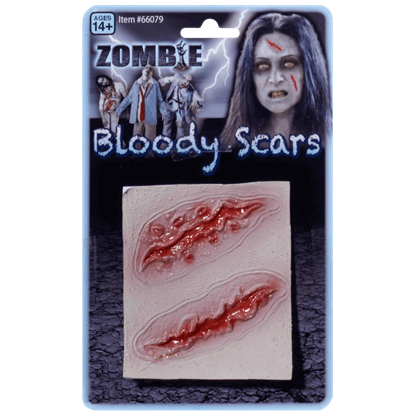 This All Patched Up Wound Set features three gruesome and grisly patches of flesh that have been haphazardly stitched into place. Some creature decided you look like a tasty snack and tried to take a bite! The Animal Attack Prosthetic allows you to show off the gory wound left behind by the unfriendly beast and horrify your friends with the realistic injury. This is not your average, everyday, life-threatening gash. Instead, the Another Mouth to Feed Wound Prosthetic is a gruesome and gory mutation that has turned a life-threatening injury into something truly monstrous. The chemical warfare of the apocalypse has given you a monstrous appearance with this costume appliance! The Apocalyptic Foam Prosthetic is an excellent special effect, especially since it will shift and move along with your face. 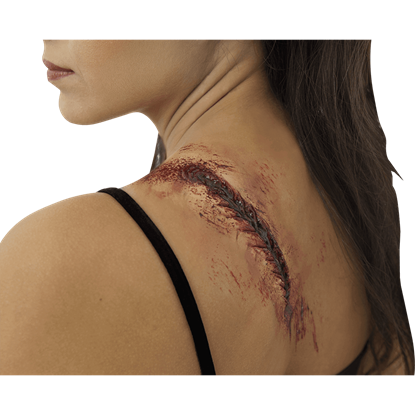 You can appear as though someone has taken a whip to your back with a vengeance when you wear this gory wound prosthetic. 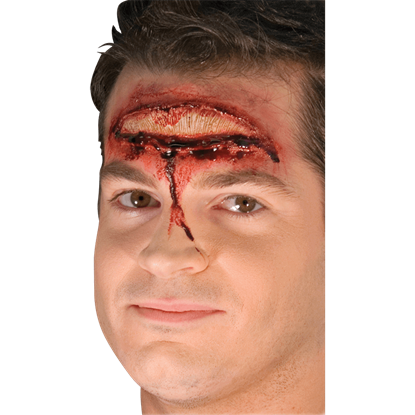 The Back Lash Latex Appliance provides a realistic and horrifying laceration prosthetic for your look. 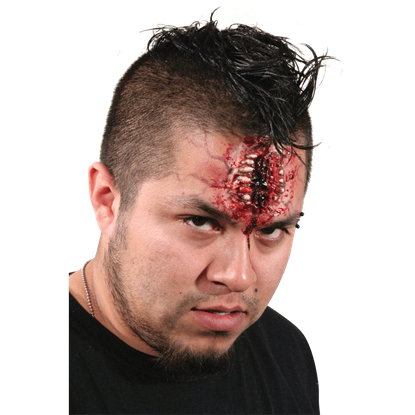 This realistic forehead gash prosthetic makes a horrifying addition to any costume ensemble. The Bad Headache Latex Appliance features a lightweight, pre-colored latex injury that will make others squirm.